For use in boots with pre-wired THERM-IC heating elements. You'll receive 2 Ni-MH battery packs with intergrated heat stage switches, instructions and a global charger. Some of the boot manufactures are Atomic/Oxygen, Dalbello (only US), Sidas, Roces and Sled Dogs. 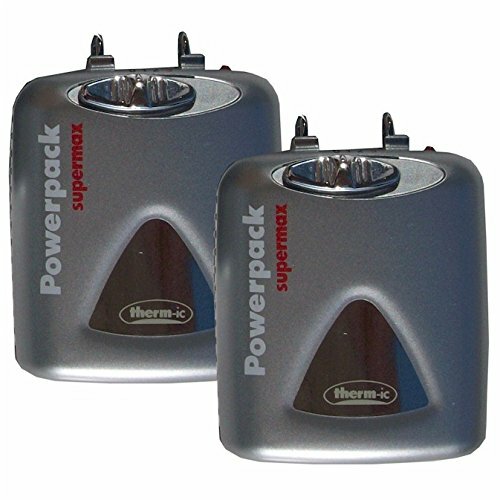 The PowerPack Supermax is unique because the global battery charger is good for US, EU, UK and Australia currents. No need for a power converter when you travel. But the charger also has a unique feature that prevents overcharging. This means you'll get long life from your batteries. The batteries have 3 settings for personal temperature regulation. Setting #1: 99° F / 37° C for up to 18 hours. Setting #2: 113° F / 45° C for up to 8.5 hours. Setting #3: 158° F / 70° C for up to 3 hours. Keep in mind you don't have the power on all day. You can turn off the batteries when you go inside or when your feet are warm.